Four Yummies with Jam and Devon Cream in a Large Heart Shaped Gift Basket! 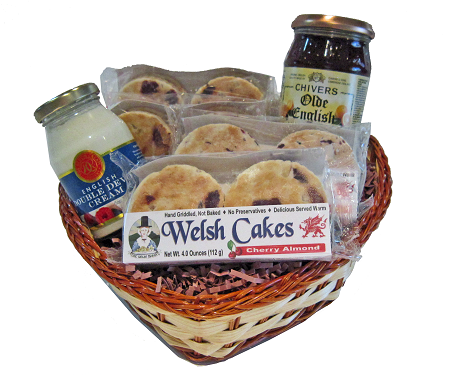 This Gift Option contains four packages of yummies in the flavors of your choice presented in a beautifully woven heart shaped basket and accompanied by 12 ounce jar of preserves and a 6 ounce jar of genuine imported Devon Cream. This is a unique gift you can be sure nobody else will duplicate and one they will always remember. ►Personalized Gift Cards, Alternative Delivery Address and Delayed Delivery requests are specified at check out. ►If ordering multiple gifts going to different people, you will need to place separate orders. ► We offer FREE PRIORITY SHIPPING on all gift options. We ship from California using USPS Priority Mail. Normal delivery is 2-3 business days to Mid-US and East-US, 1-2 days to Western US. Best to order by Dec 19 to ensure Christmas Day delivery. Western US states may still arrive by Dec 25 if order placed before Dec 22 but we cannot guarantee it. Ordering early and specifying a delayed delivery date is your best bet for time sensitive purchases.